Around this time of year we get a lot of questions about whether people convicted of a DUI can lawfully possess a firearm. Under Pennsylvania law, a person who has been convicted of driving under the influence of alcohol or a controlled substance on three or more separate occasions within a five-year period cannot sell, transfer or manufacture a firearm in the Commonwealth of Pennsylvania. Please keep in mind this is a LIFETIME BAN for a third offense during a five year window. You can be rehabilitated from this state level ban by petition to the Court of Common Pleas where there would be a burden on you to show how you are not someone who has a drug or alcohol problem. However, restoring your rights at the state level through this petition process will not change the issue on the federal level. This means that if you plead guilty or are found guilty to any form of DUI that is graded as a misdemeanor of the first degree, you cannot lawfully possess, use, transfer or own a firearm. A common misconception is that people think that if they did not do a year or more in jail, then they are ok. This is wrong. Totally wrong. The devil, if you will, is in the details. Here is where reading is super important. Questions 11 a and 11 b that is enlarged below. In Pennsylvania, there is the Pennsylvania Instant Check (PIC) system that is maintained by the Pennsylvania State Police. Pennsylvania Firearm Dealers and County Sheriffs have access the PICS program through a toll free telephone number. If an individual is eligible to acquire a firearm, the PICS background check replaces the former, mandatory five-day waiting period. They will give your particulars off this ATF form based upon what you check and what you write. 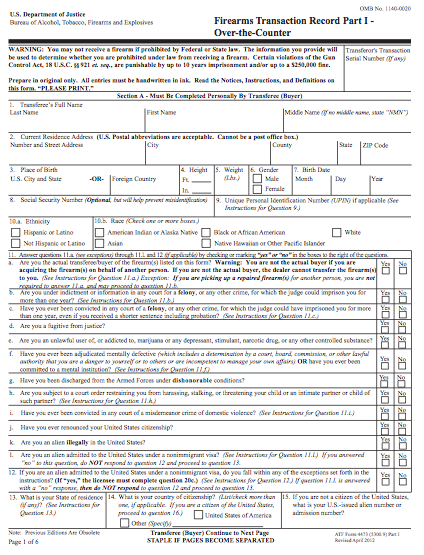 The ATF form is an affidavit and is signed and is sworn by you. The worst thing you can do is to follow the seemly informed “advice” of the gun dealer. Some of them just tell the person “Go ahead. Answer no [to questions 11a and 11b] any way and we’ll see what happens” thinking benignly in this day and age that maybe your DUI past won’t be on the computer. If you fill out this form incorrectly or untruthfully you are subject to two potential forms of prosecution. The first is federal prosecution for perjury and other related crimes under the US Code. The potential maximum sentence is five years. The more frequent form of prosecution are state level charges prosecuted by the local DA’s office. Every failure of PICS is referred to the local PSP barracks for follow-up investigation. Usually the Trooper will simply call you on the number you put on the form and will want to “chat” about your application. Miranda rights are not required to be issued to you because you are not in custody and the Trooper does not necessarily tell you that this is an official police investigation into the matter. The Trooper will ask you questions to confirm where you were and that you actually filled out the form. The Trooper may ask about your educational background. The Trooper will typically ask you if you remember your convictions. You, thinking that you did nothing wrong, just answer away. You might even apologize. Next thing you know you are being arrested or a summons will come in the mail with prosecution for perjury (felony of the third degree) and/or some other charges such as criminal attempt to commit persons not to possess a firearm (felony of the second degree) as well as some misdemeanors. If you are denied PICS clearance, the positively worst thing you can do is to follow the advice of the firearm dealer and appeal you PICS failure under these situations. They will give you a PICS challenge form and have you fill it out. But if you do that, you will most certainly be in for a great deal of trouble. Oh yeah, and the firearm dealer who gave you this “great advice” will absolutely lie under oath or to the investigating trooper/officer and say that he or she said no such thing ever. He or she will chose themselves over you and the truth every time. Keep in mind, a DUI conviction has long lasting affects that you may never have thought of.